Both the stock and bond markets took a bit of a roller coaster ride in 2018. In light of this volatility, ABLE account owners may be wise to test and perhaps reassess the investment choices they have made for the funds in their account. 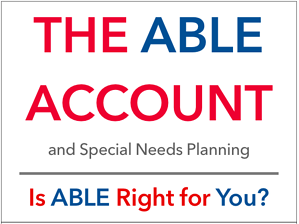 As part of an advisory group implementing the ABLE account in Massachusetts, we learned that many people opening ABLE accounts stopped the application process when they were asked to determine the investment choices for their contributions. This behavior raised a concern that individuals enrolling in the ABLE program might not have the prior experience or knowledge of financial matters to make the best selection for their situation. If you began investing in 2015 when the ABLE was first being offered, unless you withdrew funds for expenses, you most probably never saw your account balances decline in 2016 and 2017. During this period, both the stock and the bond markets experienced positive returns. Last year offered a different picture; in 2018 volatility returned to both the stock and bond markets and the returns on your investment, depending on when you put funds in, may have taken a hit. For investors with little experience, it may be a shock to observe 90 cents where they had invested a dollar a short time earlier. Regardless of how much money is in the account, it is critical to invest the funds in the ABLE account to meet the goals of the account owner. In many respects this is an opportunity to learn about how financial markets work. Now would be a good time to take a look at your account balances and gauge your reaction to the performance of your investment choices in 2018. Your asset allocation, or balance between stocks, bonds and money markets, should be based upon your personal ability to withstand a decline in your balance and your tolerance of market volatility . Your asset allocation should align with the timing of your goals. If a portion of the funds in the ABLE are being used for transactions, owners should consider investing these monies with very low risk assets. Depending on how the account is being used, the funds should be invested to provide a mix between funding for transactions and growth for the future. See our case study below about Paul's ABLE choices. The markets have come back since the recent low on 12/24/2018, making now an excellent time to reassess your tolerance for risk and make an adjustment to your ABLE account. This should be a thoughtful and informed evaluation; federal law allows account owners to change investments in their ABLE account twice per year. Be sure you are comfortable that the money is invested to meet both your short-term needs and your long-term goals. Content in this material is for general information only and not intended to provide specific advice or recommendations for any individual, nor intended to be a substitute for specific individualized tax or legal advice. We suggest that you discuss your specific situation with a qualified tax or legal advisor. Prior to investing in an ABLE account investors should consider whether the investor's or designated beneficiary's home state offers any state tax or other benefits that are only available for investments in such state's ABLE program. Withdrawals used for qualified disability expenses are federally tax free. Tax treatment at the state level may vary. No strategy, including a diversified strategy, assures success or protects against loss.